An area of low pressure across south-eastern areas of Britain has given some persistent and heavy rain over the last couple of days, with parts of Surrey and Sussex seeing more than a month’s worth of rainfall in 36 hours. Rain is still currently falling in parts of the South East and heavy showers are forecast for south west England and Wales. The Met Office currently has severe weather warnings in place for south west England, Wales and south east England for further heavy rain. The table below shows rainfall totals from 7 pm Sunday evening until 7 am this morning. Wiggonholt in West Sussex has seen 72 mm of rain, almost one and a half times its monthly average for June of 52.9 mm. The jet stream is partly to blame for our unsettled conditions at the moment. It is currently flowing to the south of the UK, allowing a series of low pressure systems to spread in from the Atlantic. There are many factors which can impact the notoriously changeable weather in the UK, so no single one on its own can be said to be fully responsible. However, it is possible to isolate contributing factors and, in this case, one of those is the northern hemisphere jet stream. This is a narrow band of fast flowing westerly winds (ie blowing from west to east) in the high atmosphere. This band moves around and also changes its track, from a fairly straight line to something more closely resembling a meandering river. 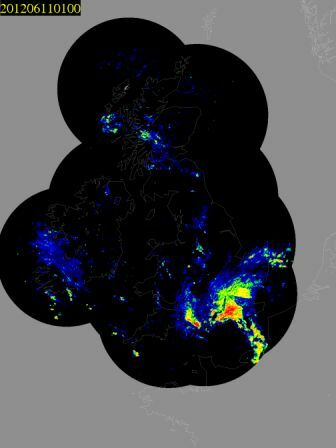 Its position can, and does impact weather in the UK and other parts of the northern hemisphere. This entry was posted in Met Office Images, Met Office in the Media, Met Office News and tagged heavy rain, Jet stream, National Severe Weather Warning Service, rain, rainfall, severe weather. Bookmark the permalink.